TYPE: Twin-turbine commercial utility helicopter. 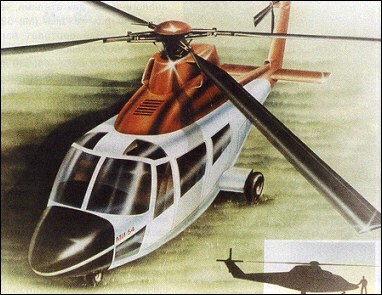 PROGRAMME: Project announced summer 1992; at preliminary design stage by 1993, to replace Mi-2 and Mi-8; model displayed at MosAeroshow '92; single-engined version for Asian market also being studied; no further progress reported. DESIGN FEATURES: Configuration shown in accompanying illustrations; four-blade composites main and tail rotors; high excess power will permit operation as Cat A helicopter from sites of limited size; intended for passenger/cargo, oil rig support, ambulance and executive duties. LANDING GEAR: Non-retractable tricycle type; single wheel on each main unit, carried on short sponsons; twin nosewheels; tailskid. POWER PLANT: Two Saturn/Lyulka AL-32 turboshafts, each 574kW, mounted side by side above cabin. ACCOMMODATION: Normal seating for 10 to 12 passengers. No, theres different design features. Looks like an S-76 all the way.